Is licking ice cream obscene? An ultra-orthodox Jewish sect is targeting Jerusalem ice cream stores — squirting glue in their locks, breaking windows and worse. Why? 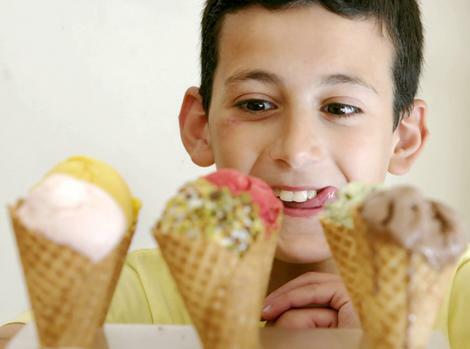 The ultra-orthodox Sikrikim say that they are disgusted by people licking ice cream in public — and that such behavior promotes promiscuity, much like dancing. Although there was no dancing going on at the Zisalek Ice Cream Parlor, there were other outrages, such as men and women using the same entrance — something the Sikrikim cannot tolerate, according to the British newspaper the Daily Mail. The sect is named in honor of Jewish rebels who 2,000 years ago rose up against the occupying Roman army and took vigilante action against suspected Jewish collaborators. Attempting to placate the Sikrikim, the owners of the ice cream parlor in Jerusalem’s Mea Shearim neighborhood had put up posters asking people not to consume the snacks in public and installed separate entrances for men and women. Many live below the poverty line and tend keep to their own towns and neighborhoods. Mea Shearim is small, less than half a square mile, and home to about 30,000 residents considered among the most tight-knit and reclusive of Israel’s ultra-Orthodox Jews. Other stores in the neighborhood, where men wear traditional black garb and women bare little but their face, have had their windows broken, locks glued and foul-smelling liquid smeared on walls. Her shop has been attacked more than 10 times since it opened a year and a half ago, she told the Mail. The latest assault was last week. She has met with the Sikrikim several times. Although the store only sells religious books, it has drawn their fury by stocking titles published by Zionist organizations; the Sikrikim believe a Jewish state can be established only with the coming of the Messiah. “They claim to be religious but what they do is a crime against God, against the Torah and against humanity,” said David Rotenberg, who works at the bookstore.